Flexible partial denture repair is needed when flexible partial cracked or broken. Valplast partial teeth considered being unbreakable, but that’s not really true. Even with flexi partial dentures, accidents happen. There is no denture glue that can fix flexible dental partials. Do not panic, flexible partial dentures can be repaired! Contact us for urgent flexible partial repair service. 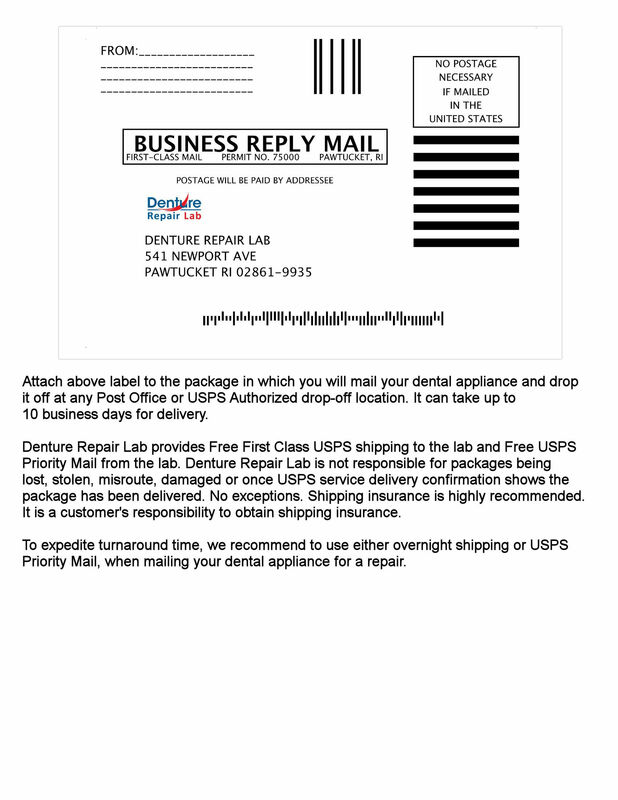 FREE USPS Priority Return Shipping >>Fixed dentures mailed back same day with complimentary USPS Priority Mail. Upgrade to USPS Express for $25. Check delivery time at the time of order confirmation. All packages shipped insured up to $50 and signature required. Denture technology is improving all the time. Flexible partials are a relatively new development in denture materials. With flexibles, the teeth are attached to a slightly flexible, gum-colored base which extends to make the clasps. They offer a metal-free alternative to partial denture wearers. Because this special type of partial dentures can bend and flex, they do resist fracture or breakage. But they are not indestructible. Because of the special nature of the materials, repairing flexible partial dentures requires extra skill. At Denture Repair Lab, we have professional, experienced dental technicians on our staff who are highly skilled in working with these new materials. They use special techniques and the best quality components to repair your flexible partial dentures. We repair all kinds of flexible partials, such as Valplast, TCS, Flexite, and others. If you need to replace a missing tooth or repair a chipped tooth on your flexible partial, contact our Customer Service for more details. We know how hard it is for you to be without your flexible partial dentures. So, we guarantee that all repairs will be completed on the same day we receive them. We then mail it back to you with our complimentary USPS Priority Mail or you can upgrade to USPS Express for only $10. We will provide the tracking number for you. All flexible partial repairs are backed with a 30-day warranty on materials and workmanship. In order to properly repair flexible partials, all types of glue, self-repair materials or any other adhesives used to self-repair flexible partial teeth MUST be professionally removed. Although nearly all flexible partials can be restored, in some unusual cases, they may be damaged beyond repair. Indicate the number of breaks or cracks here. Once your flexible partial has been received, a complimentary inspection will be performed and you will be notified of the cost prior to the repair. Loose teeth on flexible partial dentures can be repaired. If you have more than two loose, broken or missing teeth, please contact us prior to placing an order. We offer specialized professional cleaning and polishing of your repaired and restored denture, using dental grade materials and equipment. The American Dental Association recommends that denture wearers professionally clean their dentures every six month, to avoid bacteria accumulation and tartar build-up. While getting your denture repaired, you can have a duplicate denture made. A duplicate denture is an exact copy of your original denture. A duplicate denture will bridge the gap of being without a regular denture while it is being repaired, restored or replaced. Our duplicate dentures are made with high quality acrylics and all details are transferred, ensuring same fit as the original denture. No adjustment needed. Just complete a simple order form, and mail your broken denture along with your information (or online order confirmation) to us, using the free USPS shipping label we will provide. Once your denture is received and inspected, we will contact you to confirm your order and obtain billing information. Your denture will be repaired and mailed back the very same day with complimentary USPS Priority Mail or upgrade to USPS Express for $25. To expedite turnaround time, send your broken dentures with overnight mail to us. Please DO NOT send in your "favorite" denture boxes, dental containers or any other containers that have a value to you, along with your dentures/partials, since it will not be returned due to shipping weight restrictions.